Online stream anime episodes, Watch Naruto Shippuuden Episode 4 English Subbed online and free episodes. Anime Episode guide, Chapter Naruto Shippuuden Episode 4 English Subbed English subbed The Jinchuriki of the Sand Deidara tries to strike, but Gaara’s sand manages to push him away. An aerial battle between the two ensues above Sunagakure. Meanwhile, Kankuro is alerted to the presence of Akatsuki in the village and he begins to mobilize the troops. 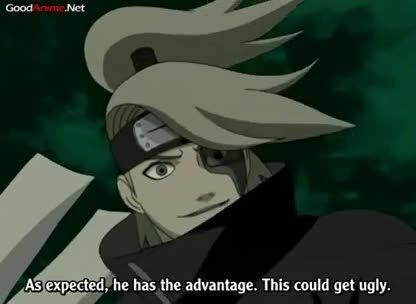 In Konoha, Naruto and Sakura continue to fight against Kakashi, but are unable to get past Kakashi’s barrage of elemental jutsu to get the bells from him. Later on, Naruto manages to trick Kakashi by pretending to ruin the ending of his new book; with Kakashi’s ears covered and eyes closed, Naruto and Sakura get their bells and finish the test.